Strange radiation streaming from the core of our Milky Way galaxy may be a long-sought signal of dark matter, the elusive stuff thought to make up much of the universe, a new study reports. 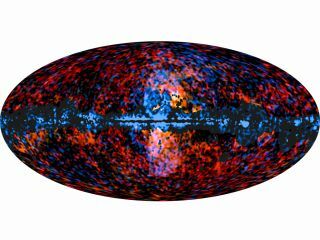 Researchers using the European Space Agency's Planck satellite have characterized in great detail the radiation that forms a mysterious haze at the center of our galaxy. And they suspect the fog isn't generated by the "normal" matter that makes up everything we can see and measure. "The radiation cannot be explained by the structural mechanisms in the galaxy, and it cannot be radiation from supernova explosions," study co-author Pavel Naselsky, of the Niels Bohr Institute at the University of Copenhagen in Denmark, said in a statement. "We believe that this could be proof of dark matter," he added. "Otherwise, we have discovered [an] absolutely new (and unknown for physics) mechanism of acceleration of particles in the galactic center." In the new study, researchers used Planck and WMAP data to look at the spectrum of haze radiation in microwave wavelengths. They determined that it is most likely synchrotron emission, which is produced by electrons and positrons streaking at incredible speeds through magnetic fields at the center of the galaxy. Dark matter is thought to be scattered throughout much of the universe, and is likely to be very dense at the centers of galaxies, researchers said. One of the leading theories of dark matter suggests it is made of particles called WIMPs (weakly interacting massive particles), which are both particles and antiparticles. When two WIMPs collide, they will annihilate each other (just as all matter and antimatter partner particles do when they meet). "We know from theoretical predictions that the concentration of dark matter particles around the center of galaxies is very high, and we have a strong argument they can collide there and in the collision electrons and positrons are formed," Naselsky said. "These electrons and positrons start to rotate around the magnetic field at the center of the galaxy and in doing so produce this very unusual synchrotron radiation," he added. Thus, the researchers may be seeing microwave radiation released by the annihilation of dark matter. The findings appear to fit in with recent observations by the Fermi Gamma-Ray Space Telescope, which spotted a glow of gamma-ray light at the center of the Milky Way that may also be attributable to dark matter annihilation. "The microwave haze morphology is consistent with that of the Fermi gamma-ray 'haze' or 'bubbles,' indicating that we have a multi-wavelength view of a distinct component of our galaxy," the researchers wrote in a paper reporting their findings posted on the online astronomy preprint site arXiv.org. The study has been submitted to the journal Astronomy and Astrophysics.